All works have been treated with a stabilising solution and are supplied with a white mdf support and a certificate of authenticity that includes an image of the location the work was sourced from. Leo Fitzmaurice often employs material designed by other people and applies a simple or subtle change to alter our perception of it. This change is usually made to the information that the object is trying to communicate. In the work Recouper, Leo has used the graffiti on a brick wall that borders a car park. The wall has a series of bays that contain a small sloping brick and concrete filler. These fillers and the graffiti upon their surfaces is the information that has been appropriated for use as an edition. Leo has removed the sections of concrete, which naturally broke into sections of different sizes creating a ready-made edition. The parts are curious and complex, with their physical removal from the original location they take on the role of an object as precious historical artifact. 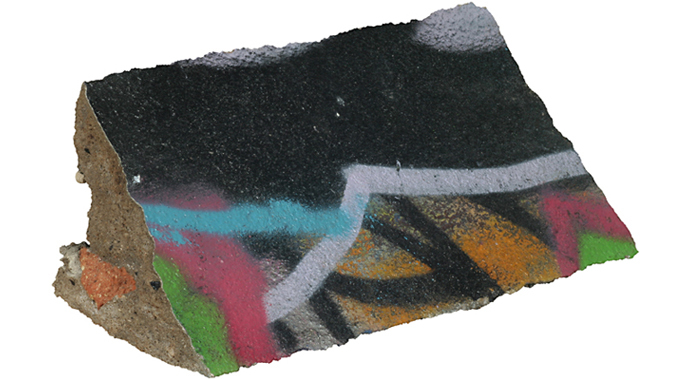 Part painting, part sculpture, the concrete relics express the clichéd qualities graffiti has as a decorative part of our environment. Having been removed from their original context, the sections demonstrate the potential graffiti has for unwitting charm. The work also explores ideas of authorship, vandalism and ownership. By chipping out part of the wall Leo has revealed a blank strip that is the exposed original wall hidden behind the layers of graffiti upon it. The pieces of the edition are linked to this location in the way that missing pieces of a jigsaw puzzle still have a connection with the image they came from. The material has been removed from its original location and will be scattered as the pieces are sold. A certificate of authenticity is supplied with each work along with an image of the source of the material that locates the exact spot that the work originated from. The edition numbers locate the work in order from left to right. Leo’s work is held in a number of collections and he has exhibited internationally since 1998. Group-shows include EASTinternational, John Moores 23, slimvolume, Artfutures 05 and Deptford X. Recent solo projects have included Neat Stuff at firstsite, Detourist for MOT international in association with Rogaland kunstsenter, Norway, K3, Zurich, General Public, Berlin and Royal Standard, Liverpool. He has curated Stuff Happens at Angel Row in Nottingham and both Up in the Air and Further Up in the Air in a tower block in Liverpool. His recent publication with Paul Rooney, Wrongteous, has been nominated for Granta book of the year.